I was off to a great start with a wholesome breakfast. 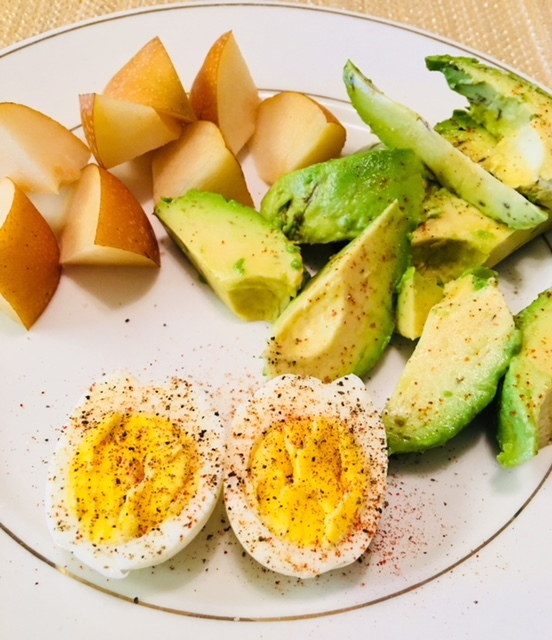 I had a glass of water as soon as I woke up and made myself this hard-boiled egg and enjoyed it with a pear and half an avocado. Great fuel to my engine. A perfect hard-boiled egg must not have any gray-green ring around the yolk, worse yet when the whole yolk turns gray. Yuck! This convenient source of protein must have a beautifully creamy yolk with a tender white. This fool-proof recipe to make hard-boiled egg within minutes is my go-to morning breakfast almost everyday. Whether you make one eff or 10 eggs the time is exactly the same. So if you wanna hard-boil some eggs in advance and refrigerate them for rest of the week, feel free. Just make sure to store them shell-on. Reduce heat and using a slotted spoon, place the egg slowly at the bottom of the pot. Cover the pot and turn off the stove. Keep covered for 8 minutes. Carefully discard water and remove egg to a paper towel and let it cool down for a couple of minutes. :- You can also place the egg in cold water to speed up the process. Cut in half. Sprinkle with paprika, salt and pepper and serve with a fruit and half an avocado for a wholesome breakfast!